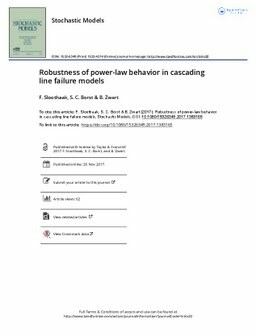 Inspired by reliability issues in electric transmission networks, we use a probabilistic approach to study the occurrence of large failures in a stylized cascading line failure model. Such models capture the phenomenon where an initial line failure potentially triggers massive knock-on effects. Under certain critical conditions, the probability that the number of line failures exceeds a large threshold obeys a power-law distribution, a distinctive property observed in empiric blackout data. In this paper, we examine the robustness of the power-law behavior by exploring under which conditions this behavior prevails.